The event will include a tour of the impressive Saint-Gobain & CertainTeed North American Headquarters and a brief presentation about the company’s significant achievements in LEED certification. Light refreshments will be served. The program begins at 3:00 PM. 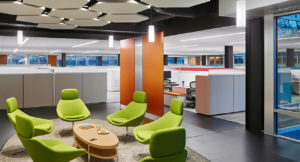 Participants will learn how the company took a previously empty and energy inefficient office building and transformed it into a modern structure that uses less water and energy and reduces greenhouse gas emissions. The tour will show how “smart” electrochromic glass tints automatically to dynamically control sunlight to optimize daylight, maintain outdoor views and enhance comfort by preventing glare and solar heat; how rain is collected off the roof to supply water to irrigate the grounds and the waterfall and how solar panels on the roof will help to power the building, and much more. In addition, Saint-Gobain, one of the world’s largest building materials companies, will talk about leading edge and innovative materials that help commercial buildings and residential homes achieve energy efficiency and well being in places where people live.